Also read – Yamaha R15 launching soon! The R15 V3.0 is powered by a 155cc liquid-cooled engine that gets the latest Variable Valve Actuation(VVA) technology. The engine churns out 19.3 PS of power at 10,000 rpm and 14.7 Nm of torque at 8,500 rpm. The engine comes mated to a six-speed gearbox which features a wet-type clutch with a slipper and assist feature. The rear swingarm is now made of aluminium which is a segment first and the results are definitely going to favour the rider. The front gets inverted telescopic shocks while the rear gets a link monoshock. The R15 V3.0 weighs 137 kg that is 17 kg less than the RC 200. The RC 200 features a 199.5cc liquid-cooled engine that churns out 25 PS at 10,000 rpm and 19.2 Nm of torque at 8,000 rpm. The engine transfers the power via a six-speed close-ratio gearbox that features a slipper and assist clutch. The front of the RC 200 features upside-down shocks and the rear gets a monoshock. On paper, the KTM RC 200 is the clear winner but in real-time use, the RC 200 often feels too hard and track focussed whereas the R15 is more nimble and allows the rider enough comfort for a short road trip. 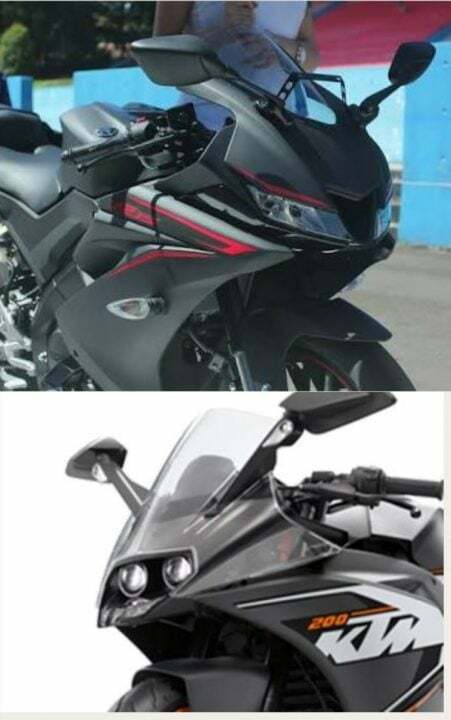 The upcoming Yamaha R15 V3.0 features a twin-headlight full LED unit in the front which further accentuates the sharp and sporty nature of the bike. The taillight gets LED too and neatly tucked in into the rear section of the bike. The tachometer features a full digital layout providing the necessary info to the rider along with a segment-first gear shift indicator for that perfect track run. The bike features disc brakes on both ends but unfortunately misses out on the ABS. On the other hand, KTM RC 200 gets dual-projector headlamps but with halogen bulb only which limits the beam’s range. The taillight features twin sharp lines style LED. The tachometer on the RC 200 is digital too and the readout is clear and crisp. The RC 200 features disc brakes at both ends that come equipped with ABS for a safer ride. The KTM RC 200 is currently on sale and retails for INR 1.73 lakh ex-showroom Delhi. Yamaha will be launching the all-new R15 V3.0 soon and is expected to be priced between INR 1.3 to INR 1.5 lakh. With a lower weight and price, better on-road ride quality and enough tech on board to satisfy the inner geek inside us, the new R15 is all set to win. The final choice is to be made by the rider if they choose to ride more on track or road. For more info, stay tuned to find out. So, what do you think of our Yamaha R15 V3.0 vs KTM RC 200 comparison? Share your views with us by commenting below. Also, stay tuned for laterst news updates and comparisons of cars and motorcycles relevant to India.